Positioned just off I-35W between Minneapolis and St. Paul, Radisson Hotel Minneapolis/St. Paul North offers a prime location close to the area’s most popular attractions. From our convenient hotel in Roseville, MN, I-694 and Highway 36 provide easy routes to meetings at Centre Point Business Park, concerts at Xcel Energy Center and NBA games at the Target Center. For Vikings football, concerts and extreme sports, head to U.S. Bank Stadium, just six miles away in Minneapolis. Savor fresh seafood and juicy steaks in the award-winning atmosphere of our on-site restaurant, AXELS. In addition to breakfast, lunch and dinner menus, AXELS boasts a wine list with more than 150 selections. Ready for a quiet night on your own? Allow us to pamper you with fresh, flavorful cuisine delivered straight to your door when you order from the room service menu. TCF Bank Stadium – Less than six miles from our location, this 50,805-seat stadium on the University of Minnesota campus is home to the Golden Gophers football team. Minneapolis Institute of Art – Located about 15 minutes southwest of the hotel, this museum has garnered international acclaim for its impressive art collection, which boasts more than 80,000 works spanning multiple genres and periods. Mall of America – A shopping paradise, a dining extravaganza and an amusement park—the Mall of America combines all these elements into one unforgettable destination. Located approximately 20 miles from our hotel, this mall is worth the drive. From the privacy of the Fairview Boardroom to the elegance of the Emerald Ridge Ballroom, the Radisson offers an ideal venue for your professional event or social gathering. If you’re making wedding plans in the Twin Cities area, let our dedicated wedding planners help you create a memorable experience for you and your guests. Our facilities can accommodate up to 420 attendees in 8,000 square feet of space, and modern amenities like free Wi-Fi, a sound system and LCD projectors provide the technology to support your successful meeting. St. Paul accommodations with contemporary styleAt Radisson Hotel Minneapolis/St. Paul North, we invite guests to relax on pillowtop EverNu mattresses in each of our 255 stylish rooms and suites. Connect to free Wi-Fi from the expansive work desk, or watch your favorite shows on a 37-inch flat-screen TV. Place your breakfast order with room service before you sink into a freshly made bed with quality linens, down pillows and an ultra-soft duvet cover. For extra space and upgraded amenities like a wet bar and a microwave, book one of our spacious Junior Suites. 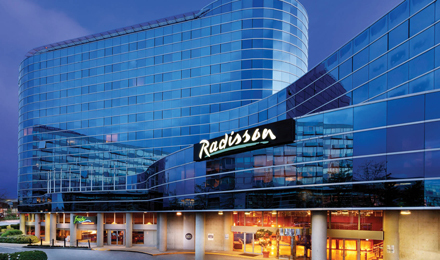 Upgrade your stay at Radisson Hotel Minneapolis/St. Paul North by adding an amenity package to any of our great room rates. Call the hotel directly after making your reservation to request one of our special packages. Late check-out at 1 p.m.
Reserve a Standard King Room for one king bed and a twin sleeper sofa, or book a Standard Queen Room for two double beds and a comfortable armchair. The Business Class Room offers access to upgraded amenities, services and benefits to help you work more efficiently. Celebrating a special occasion? Radisson Hotel Minneapolis/St. Paul North offers Presidential Suites and two types of Whirlpool Suites, which feature an in-room whirlpool for two. Please contact the reservations desk for more information on these suite types. Savor fine dining on site at AXELSLocated on site at the Radisson hotel in Roseville, MN, the award-winning AXELS restaurant offers an extensive menu of American dishes, an upscale atmosphere and a remarkable wine list with more than 150 selections. Sample a new dish every day of your stay as you choose from our famous chargrilled steaks, our comforting pasta dishes and our crisp salads. Take advantage of AXELS restaurant’s room service menu to enjoy fine dining from the comfort of your room or suite. Visit the AXELS website to view the full menu, and then have your favorite meal delivered straight to your door.